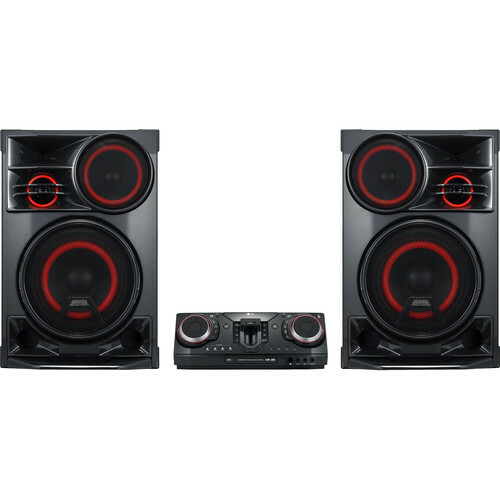 Enjoy powerful, dynamic audio with the LG CL98 XBOOM 3500W Bluetooth Music System. It delivers up to 3500W of total power from its two 4-way speakers. Each speaker has a 1" tweeter, a 4" mid-woofer, an 8" woofer, and a 10" woofer for enhanced bass reproduction. Bluetooth is built-in for wireless music streaming from compatible devices like smartphones and tablets. The CL98 has two USB ports that support audio playback from compatible USB drives. The RCA input allows you to connect a more traditional audio source, and the integrated FM tuner allows you to enjoy free over-the-air radio programming. The built-in CD player supports MP3- and WMA-encoded CDs.